UPDATED: Tue., May 15, 2018, 10:35 p.m.
Four-year-old Gemma Moore often points out the K27 call sign of her fallen father, Coeur d’Alene police Sgt. Greg Moore, a tribute seen on hundreds of vehicles in Kootenai and Spokane counties. By the time she’s in high school and her teenage brother, Dylon, is an adult, many of the popular stickers will have peeled and withered. The shrine dedicated in their father’s memory, the K27 Forever Memorial, aims to grace downtown Coeur d’Alene as long as its name suggests. 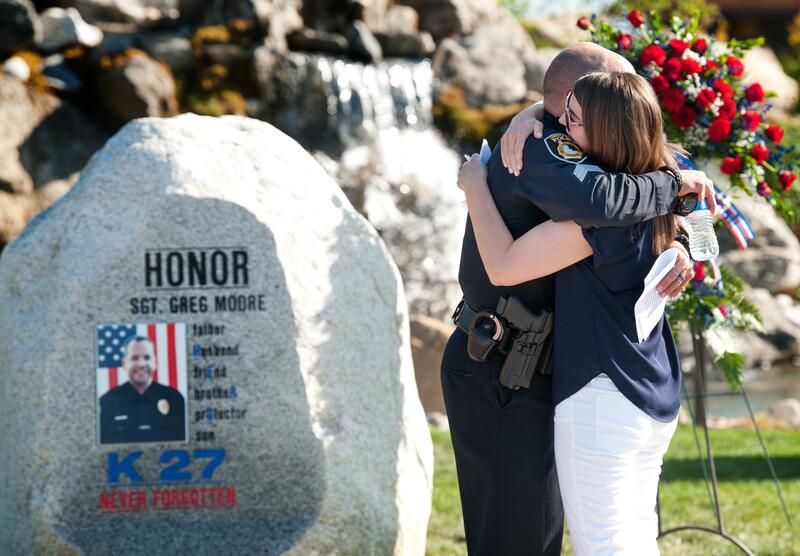 Hundreds of patrons flocked to McEuen Park on Tuesday for the dedication of the fountain, a picturesque water feature made of stone memorializing the Lake City’s officer shot and killed in the line of duty May 5, 2015. Two police helicopters soared over the memorial – a stone’s throw from Lake Coeur d’Alene and the scenic woods of Tubbs Hill – to commence the ceremony as multiple local law enforcement agencies solemnly marched to the sound of bagpipes. Three years after Moore’s slaying and roughly six months after his killer, Jonathan Renfro, was sentenced to death, architect Jon Mueller’s design was shown to the audience under sunny skies. The memorial presentation coincided with national Peace Officers Memorial Day, a day honoring law enforcement officers killed in the line of duty. Moore’s close friend and fellow law enforcement officer, Johann Schmitz, hopes the shrine not only evokes the memory of Moore but all who died in the name of service. A fundraiser-driven project spearheaded by the Panhandle Parks Foundation, the memorial has three waterfalls – individually carrying labels of Respect, Honor and Remember – that cascade over a submerged blue light, representing the thin blue line. “It reminds us to remember our current and former law enforcement personnel who protect us everyday, and it’s a lasting tribute to Sgt. Greg Moore,” Coeur d’Alene Mayor Steve Widmyer said. Published: May 15, 2018, 9:53 p.m. Updated: May 15, 2018, 10:35 p.m.